What if eye-tracking games could improve the lives of people living with autism? At some point we’ve probably all found ourselves immersed in a video game—having fun while trying to advance to the next level. But what if games could do more than entertain? What if they could improve cognitive behaviors and motor skills at the same time? If you look away, you crash your spaceship. 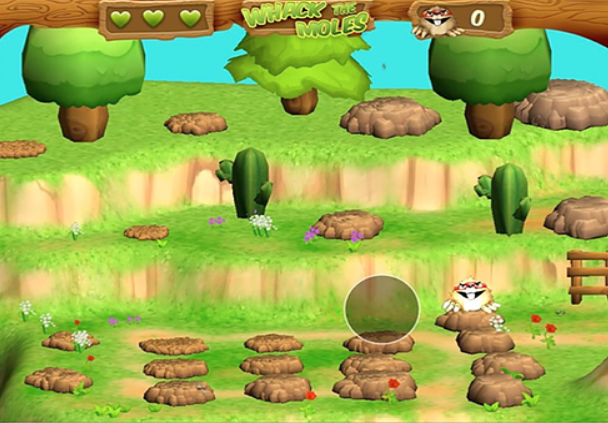 Gaze-driven games harness the connection between eye movement and attention, training players that better engagement gets better results. Courtesy Alex Matthews, UC San Diego Qualcomm Institute. Those are some of the questions that led neuroscientist and eye tracking expert Leanne Chukoskie to create video games that do just that. Chukoskie now directs the Power of Neuorgaming Center (aptly shortened to PoNG) at the Qualcomm Institute. There she and her team create video games to help people on the autism spectrum lead fuller lives. 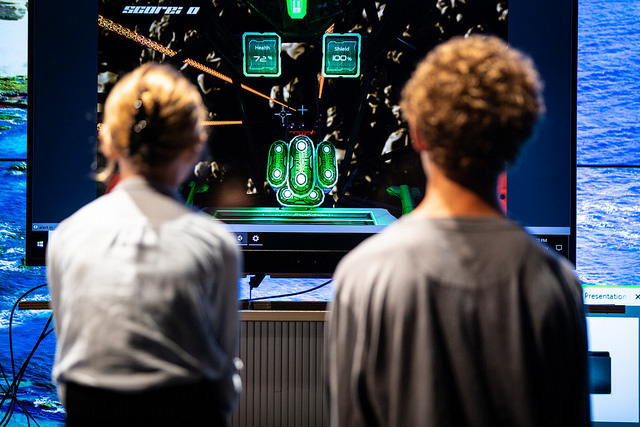 Together with Jeanne Townsend, director of UC San Diego’s Research on Autism and Development Lab, Chukoskie saw an opening to explore neurogaming as a way to improve attention, gaze control and other behaviors associated with autism. The video games are gaze-driven, which means that they are played with the eyes, and not a mouse or a touchscreen. The power of attention. UCSD researchers are developing games that train attention-orienting skills like a muscle, improving social development outcomes for children with autism. Courtesy Global Silicon Valleys. 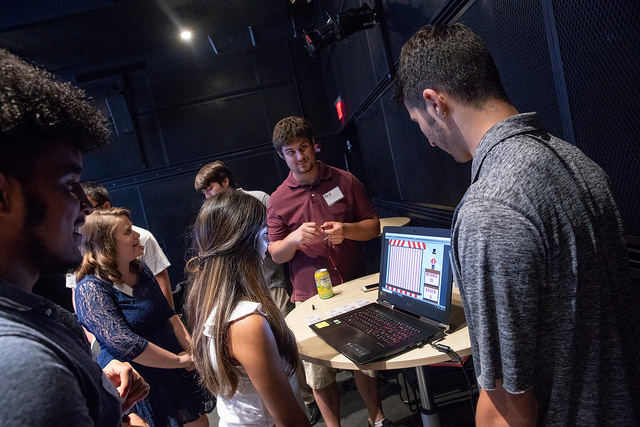 Chukoskie and her team, which includes adults on the autism spectrum and high school students, created four games and are busy making more. Their work was recently on display at the Qualcomm Institute during PoNG’s 2018 Internship Showcase. “Dr. Mole and Mr. Hide is one of our favorites. It’s basically what you think it is—all these little moles pop out of holes and you have to look at them to knock them back down. There are ninja moles you want to hit. Then the player begins to see professor moles, which we don’t want them to hit. (My joke is we don’t hit professors at UC San Diego!) This promotes fast and accurate eye movement and builds inhibitory control,” she explained. Getting the games in the hands of people who can benefit from them most is another aspect that keeps Chukoskie busy. She and Townsend co-founded BrainLeap Technologies in 2017 to make that goal a reality. BrainLeap Technologies is headquartered in the Qualcomm Institute Innovation Space, just a short walk from the PoNG lab. Dr. Mole and Mr. Hide. Knocking down moles as they pop out of holes promotes fast and accurate eye movement and builds inhibition control. Courtesy BrainLeap Technologies. As with her lab, students and interns play a critical role at BrainLeap Technologies. They bring their creativity, energy and skill. In return, they develop professional skills they can take into the workforce and their communities. Not just for autism. Neuroscientist Leanne Chukoskie is also exploring using video game simulations with sensors that monitor stress responses as a possible intervention against human trafficking. Courtesy Alex Matthews, UC San Diego Qualcomm Institute. Chukoskie’s enthusiasm and knack for developing products with real-world applications is creating buzz within the walls of the Qualcomm Institute. She is exploring other fields where neurogaming could have an impact. One area is human trafficking. Could video simulations with sensors that monitor stress responses help people recognize subtle signs of danger first in a simulation and then later in the real world? The opportunities for interdisciplinary collaborations are endless. More than 1 in 68 children are living with some form of autism, and each diagnosis has a ripple effect on families, schools and medical professionals who support those individuals. Stanford experts have been part of the teams not only diagnosing and treating the condition, but also trying to understand its causes and helping people with autism and their families live full lives. Recent Stanford advances in understanding autism have come, in part, through scientists working across disciplinary boundaries. Clinicians, neuroscientists, engineers and educators have been collaborating to help people with autism and their families. Autism emerges gradually and its signs run across a spectrum from mild to severe, making it a challenge to diagnose. Without this accurate information, parents can’t start accessing treatment for their children. Making it faster and easier to diagnose the condition, new tools aim to speed the process of getting kids started in therapy. Those therapies are also getting better, with drugs under development that target cardinal features of autism, and apps that teach people with autism to communicate and interact. Speeding the rate at which children start getting treatment, these advances improve their chances of receiving help. Despite the number of people diagnosed with autism each year and the high personal and financial cost of supporting those individuals, very little is known about what disruption in the brain’s intricate wiring causes the condition. Stanford scientists are now beginning to unravel the brain differences that underlie autism, and also tease apart how those changes alter the way autistic brains process and respond to the world. These discoveries have come, in part, through advances in technologies for imaging the brain at work and for probing the neurons’ inner workings, and in some cases through a very personal quest to understand this devastating disease. People’s daily interactions rely on subtle social clues and facial expressions that are critical for communication but indecipherable to those with autism. Deficits in social and emotional skills can range from challenging to completely disabling, and put an incredible burden on those who care for people with autism. Stanford researchers have created a number of tools to help people with autism navigate their daily lives and to support families in accessing resources. These include classes to help families understand and participate in autism therapy and apps to connect families with resources. 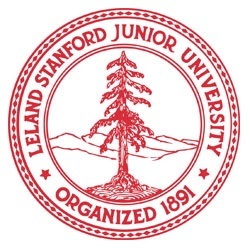 There are even engineering courses at Stanford that teach students how to design for people with conditions including autism. The study, led by Ryan Yuen of the Hospital for Sick Children in Toronto, Canada, used a cloud-based “big data” approach to link genetic variations with participants’ clinical data. Researchers identified 18 genes that increased susceptibility to ASD, noting people with mutations in those genes had reduced “adaptive functioning”, including the ability to communicate and socialise.